“Figga Please” Makes Men’s Figure Skating… Macho? I have a good friend of mine who, during the Vancouver Olympics, became the world’s biggest fan of men’s figure skating. Weird, right? I mean, I think most people are aware of figure skating during the Winter Olympics, but like she skipped past curling and other Internet favorites and just latched onto men’s figure skating, specifically Johnny Weir. 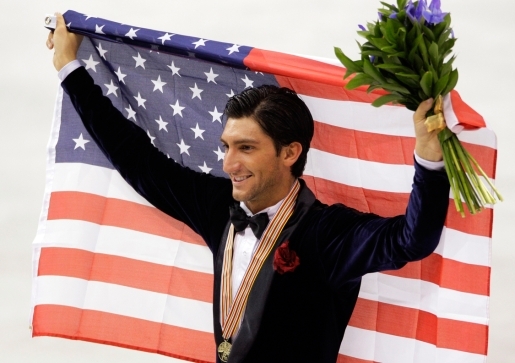 Of course, gold medalist Evan Lysacek of the USA is not one to take a dissing lightly, which is why Brooklyn rapper Don McCloskey cut a single for him called “Figga Please.” Mildly not safe for work, but pretty dirty-word-free for a rap song. I hate this song. It’s just too catchy for my brain to deal with. Thanks, Internet. I’ll have this stuck in my head all day. Still, if there’s any sport that’s secretly entertaining and could use a much-needed dose of macho, it’s probably figure skating. I mean, in pairs figure-skating? One of the crucial elements is actually throwing your partner across the ring as hard as you can while she spins in the air and then lands one one foot! That’s pretty awesome. If you can get past the sparkles, there’s some secretly crazy stuff going on.